When America entered World War II, Hollywood patriotically stepped forward to help in the war effort. Studios sent their movie stars across the country on war bond drives. It produced patriotic movies, cartoons, and other films and documentaries. Stars participated in USO shows abroad; a number of stars enlisted. Almost all were slotted into roles that capitalized on their fame and kept them far from combat. But one who rejected this “easy way out” of service to their country and successfully fought for duty that put him into harm’s way was B-24 bomber pilot Capt. Jimmy Stewart, who arrived in England on Nov. 23, 1943. 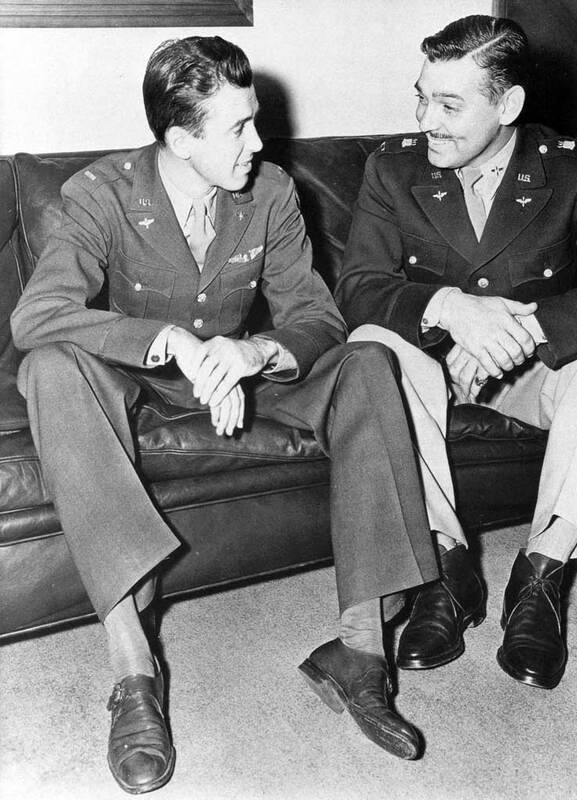 When he returned to the States in September 1945, Col. Jimmy Stewart was a bona fide hero. On his chest was the Distinguished Flying Cross with Oak Leaf Cluster, the Air Medal with two Oak Leaf Clusters, and the French Croix de Guerre with Palm, among other decorations. What makes his service even more remarkable is that this actor, who won the Academy Award in February 1941, enlisted the following month (March 22) before the country entered the war and after he had been rejected by his local draft board because he was under weight. Entering the Army at age 32, Stewart was significantly older than other cadets. Because of his maturity, educational background, and particularly because he was a licensed private and commercial pilot with more than 300 hours flying time, Stewart’s request to be assigned to the Army Air Corps was accepted and he proceeded straight into pilot training. On Jan. 19, 1942, he successfully passed the pilot training program and was commissioned second lieutenant. Over the next year, Stewart completed additional pilot courses, qualifying as a twin-engine and four-engine bomber pilot and as instructor in both types of aircraft. It was at the graduation ceremonies following qualification as a B-17 pilot in February 1943 that Stewart received a shock. Unlike everyone else in his class who received combat assignments, 1st Lt. Stewart was classified “static personnel” and assigned to the 29th Training Group at Gowen Field near Boise, Idaho, where, in accordance to that hold order in his personnel folder, he would remain as an instructor for the duration of the war. Stewart swallowed his disappointment and went about his duties like a good soldier, receiving a promotion to captain. Several months later he became alarmed over a rumor that claimed he would be taken off flying status and assigned to make training films and sell war bonds. Stewart promptly went to his commanding officer and pleaded for a combat pilot command. At this point, Stewart had more than 3,000 hours of flying time and had proved himself a respected and popular leader. Hours later, Stewart found himself going into combat. Shortly after his arrival in England, Stewart was promoted to major and transferred to the 453rd Bomb Group, part of the Eighth Air Force, and made a squadron commander. During his deployment, he maintained a pattern of behavior that endeared him to the men under his command and caused heartburn among some superiors. 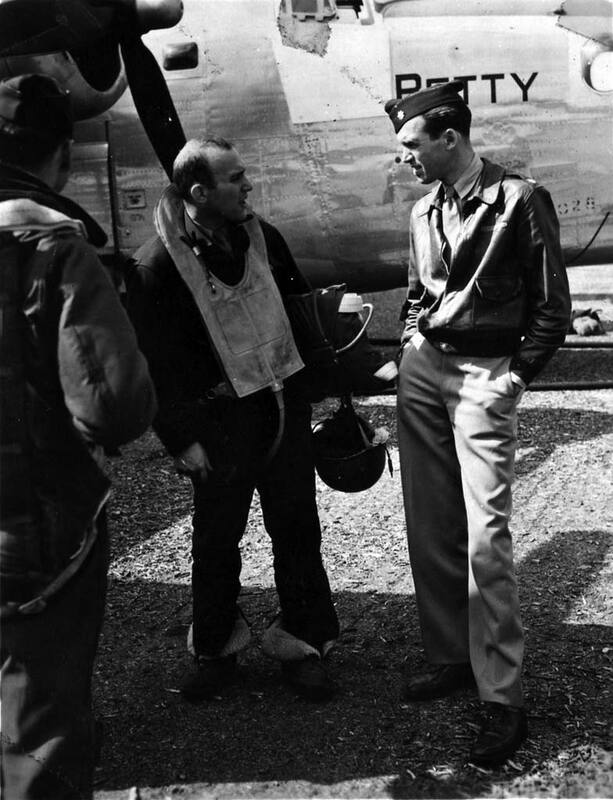 Stewart flew as often as possible as the flight leader on a mission and made a point of leading dangerous missions piloted only by volunteers. He quickly gained a reputation as a lucky pilot who always brought his crews back safely. On those occasions when he was not flying missions, he always remained at the control tower until the last B-24 returned home or was accounted for. Yet, whenever questioned about the 22 months that he spent in the European theater of operations, he said that experience was “much greater” than all his years in the acting profession. Stewart’s service in uniform didn’t stop with the end of World War II. Instead, it turned into a second career that lasted 27 years and promotion to brigadier general in 1959. Stewart led a glamorous life before and after the war. Yet, whenever questioned about the 22 months that he spent in the European theater of operations, he said that experience was “much greater” than all his years in the acting profession.